« WHICH TRAP Are We In? VICIOUSNESS! Some of the usual racists have grumbled that the French team was an African team. In 1998, racists felt it was also a Maghrebin team. Others sneered that the French team is a “legacy of colonialism”. France, a world country/ Since when is that new? There are other world countries: much of Western Europe now (including Brexiting Britain), or the USA. But France, more so. 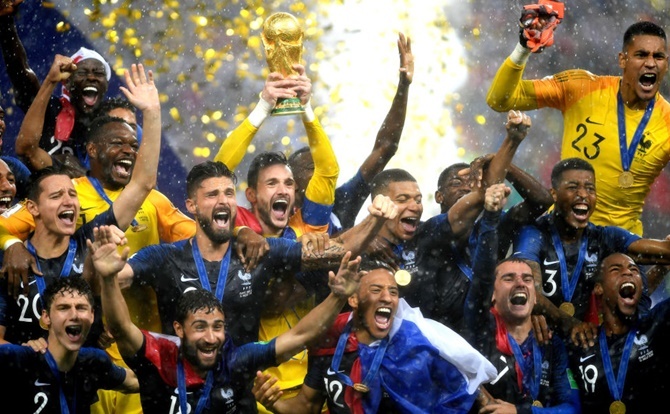 MOSCOW, RUSSIA – JULY 15: Captain and Goalie Hugo Lloris of France lifts the World Cup trophy to celebrate with his teammates after the 2018 FIFA World Cup Final between France and Croatia at Luzhniki Stadium on July 15, 2018 in Moscow, Russia. (Photo by Shaun Botterill/Getty Images) Not a legacy of colonialism, but a legacy of anti-racism. US citizens deform their ability to see the past of the USA, when they accuse countries such as France of colonialism: where are the French colons today? Nowhere. If one wants to see colonial regimes, regimes spawned by colons, one has to look at Australia, North America. If one looks at France, one sees a loved French soccer team… One does not see a land where the French killed all the Natives to establish their own regime! Want to do philosophy, love wisdom? Starting with the facts will help. Speaking of “colonialism”, where, in the end, something else happened, an entanglement of populations, not a holocaust, is important. So France is Africa, as I have long said. Nothing wrong with this. Nothing better for a French, a European to get to know Africa, and reciprocally. Indeed, I am African educated. The education of Africa is not restricted to what is taught in school, but what the continent teaches: diversity, difficulty, distraction, even dislocation and disintegration. I felt there the strongest emotions, confronted to total, mystifying desert, mountain jutting in the air, without a blade of grass, forest so thick one can’t see a thing. The elation of observing 10,000 years of human, and planetary evolution, within a few feet, sometimes. So I am major part African educated. What does “French” means, anyway? France is atop the three routes, the only three easy land routes, between the Mediterranean and the Atlantic, and in between the Mediterranean and Northern Europe. (Other lands routes go over the Alps, the Tatras, and other high mountains are difficult; mountain ranges were typically occupied by extremely fierce tribes: Hannibal lost half of his army crossing what is now the French Alps.) France was always multiethnic, and the land known as France was massively multiethnic more than a millennium before the Frankish Confederation called itself “Frank” (Free and, or ferocious). Look at the Basque: their language is so old, it’s older than the Celts and Germans. Pertinent is the persistent lack of performance of the USA in soccer (a world sport, the world sport, watched by more than two billions). The US, in spite of all the money and a giant population didn’t make the cut of the 32 better teams selected for the world cup. The Economist made a computer model which showed that the US is underperforming (while Croatia is way overperforming). Some say that US underperformance has to do with the fact minorities are poorly treated in the USA; as, in some states, such as the largest of them all, California, minorities are the majority: mistreating minorities, especially when they are the majority, would go a long way to explain the USA’s dismal result in soccer. Others claim that US football underperforms because so-called American football, baseball and basketball occupy the US obsessively. American football is an armored version of rugby breaking bones, with short bouts of “play” broken up by advertising. Clearly, those A-football players, just the way they look, are full of hormones and other synthetic drugs. Also, the sport is uninteresting to watch, as little “play” occur. The same roughly holds for the other two. Baseball symbolically involves a bone breaking bat, and weird rules where occasionally an overweight guy runs. Actually, the most overweight the baseball player, the better. A perfect sport for the overweight USA. Basketball is also an excellent game for those who condone discrimination on the basis of genes. Basketball is biased towards height. If the basket in basketball, went up or down according to the size of the player(s) approaching said basket, the activity would be more just (there are good short soccer players, example Argentina’s Maradona, 1.64 m. or Lionel Messi, 1.7 m or Poland’s Marcin Garuch, just 5 feet tall). So what gives? The US drug problem shows up in sport, I reckon. The ultimately disastrous many wins of drugged out US cyclists speaks for itself. 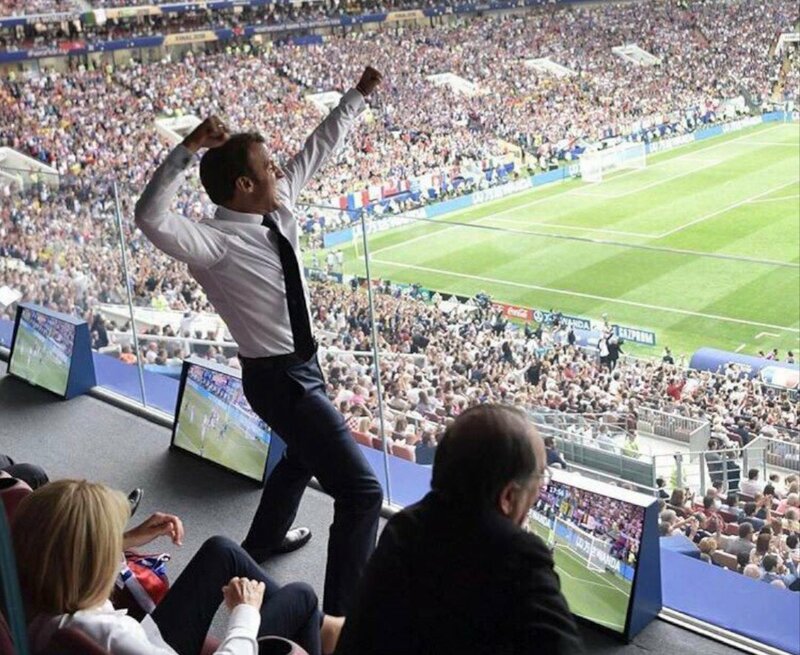 Macron, first French leader to triumph in Moscow… In front of Putin himself (immediately down left off image) France should have won either the World or Euro cups many other times in the past when she barely missed. This presidential, African style dance, is happening in front of the Croat president who came to Moscow in a charter plane, speaks perfect French, and was totally classy in victory, as in defeat! The Croatian Republic has been a member of the European Union since July i, 2013. Soccer can be unifying. Worldwide. Once one has seen enough football matches from different national teams, one can get attached to various individuals. This way, what is superficially a nationalistic contest becomes conducive to supranational appreciation. For example I found some individuals in the Croat and French teams attaching, a few games ago. Rewardingly, they were all in the final… More generally, the beauty of the gesture comes to be overall appreciated for itself. Soccer players are drug controlled (the French team was, after its win). US American-football players die like flies, from all the abuse. The French coach was captain when France won the world cup in 1998. Didier Deschamps said he didn’t select the best French players (Benzema was notably shunned) but those who could make a team. When asked if he could put the whole thing in a few words, he replied:”As the French president said it:’Vive la République!’” A true republic is a meritocracy, thus it is the power of those with highest merit (which means worth). So is the French team an “African” team, racist ladies and gentlemen? Well, the French team a world team, for a world cup. On September 3, 1939, the French Republic declared war to Adolf Hitler’s racist regime. Hitler had earlier sterilized thousands of German children of French troops who had German lovers and wives. One result of this declaration of war? Crushing infamy! A result is this sort of much less racist world we are living in, this sort of French team, multi-ethnic countries, such as France, or California. Another result? A German team where some players too are of the same skin color which revolted pale little degenerates such as Goebbels so much. Racism, and other ultimate evils can’t be just frowned upon, they have to be, forcefully, eradicated. This entry was posted on July 15, 2018 at 9:59 pm and is filed under Existentialism, philosophy, Republic. You can follow any responses to this entry through the RSS 2.0 feed. You can skip to the end and leave a response. Pinging is currently not allowed. France per her unique location where all the three trade routes form the Mediterranean to the Atlantic and the North was rendered possible only with tolerance, and that means little tolerance for racism and tribalism. The French football team is 100% French and 100% Republican: I heard three of its stars in the last few days evoke the “Republic” when asked to define their adventure as succinctly as possible…. “France”, Gaul, was spectacularly multiethnic more than a millennium before a confederation called “the Franks”, that is “the free”, self-formed by uniting a number of German tribes. The Franks united under a law called “Lex Salica” written Roman lawyers, in Latin. France is the definition of multiethnicity.